HARVESTING FORAGE IS A VERY DELICATE PROCESS, IT MUST KEEP THE QUALITY OF THE PRODUCT INTACT IN ORDER TO ENSURE THE HIGH NUTRITIONAL VALUE. 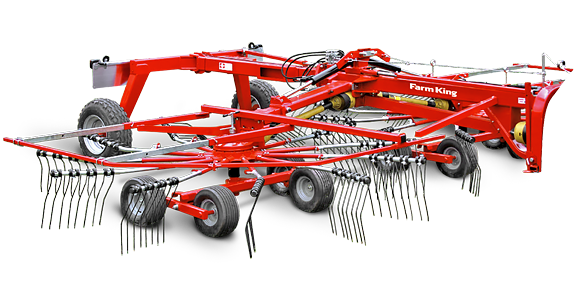 The new Dual Rotary Rake by Farm King is a semi-mounted rake designed for larger field structures and high volume production and is intended for use with 70-80 hp tractors. The forage is moved to the centre of the two rakes which overlap one another ensuring that no material is left behind on the ground.